The Peerless GBS series of woofers & subwoofers feature an innovative shallow design, best suited for applications where mounting depth is scarce and low-frequency performance cannot be sacrificed. High Bl and moving mass coupled with large peak-to-peak excursion enable low-frequency response, even in small enclosures. This design allows for the same excursion in half the height of traditional designs, while traditional materials ensure the driver is a cost-effective solution. The geometry of the diaphragm is dome – shaped, rather than cone-shaped – this allows the motor to be raised, taking advantage of the space underneath the dome, and reduces the total height significantly. Raising the motor normally would not be possible, due to the placement of the spider. The solution is to invert the spider fixation arrangement, which allows for a secondary suspension that doesn’t interfere with the new motor location. The centering of the voice coil in the magnetic gap is provided by both the surround and spider. With the use of FEA, we designed lateral stability into the suspension system, which helps to control the rocking modes and allows a reduction of distance between both suspensions. 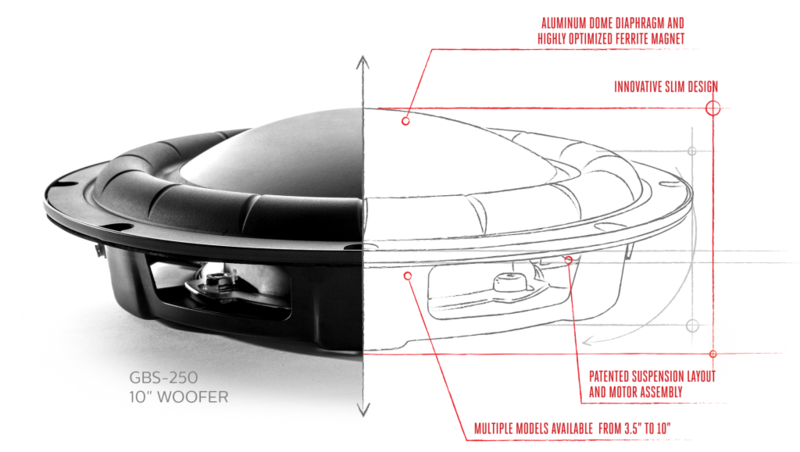 The done geometry of the diaphragm assists with mass centralization – as a result, the rocking mode center of the driver is places in a similar place as the voice coil and magnetic gap. Thus, the driver has a much higher tolerance to rocking modes than a conventional driver, which has a pendulum-like relationship between the voice coil and suspension. Both the basket and suspension components were carefully designed to allow full excursion, without risk of rocking or hard ‘bottoming’. All mechanical excursion clearances were precisely balanced to ensure that the driver is of the minimum height for a given excursion capability.